While the aim of social media is to bring people closer and encourage camaraderie, fluid conversations and discourse devoid of restrictions, it’s extremely important not to lose sight of the reality of a physical world out there. We don’t live our lives on social media, we don’t eat via the internet. We may order food through an e-commerce platform, but we still have to chew and swallow using physical organs of the body. We may have our first encounter with the significant other online, but we’d still have to meet them physically to get a first-hand feel of who they really are. There are no prices for guessing that. In much the same way, as we interact with our friends and followers on social media we must always remember that these are living, breathing people who have a face, reputation and status that cannot be totally represented through a virtual community. Whether you are in Africa, Asia, Europe or America, the truth is that not everyone is your contemporary. People’s status, power and level of influence do not change because they joke around on Twitter or Instagram. Donald Trump is not a favourite of many people all over the world, and may not carry himself in the way and manner expected of a man of his position, but that does not in any way change the reality of the immense power and authority he wields as the President and Commander in Chief of the Armed Forces of America and the most powerful man in the free world. It doesn’t. What happened to Brian Smith is a fitting example of how people shoot themselves in the foot through social media daily. 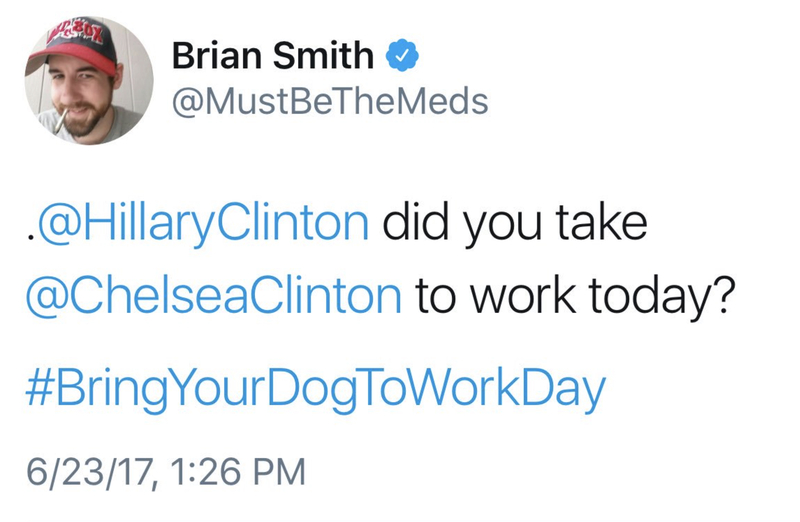 Brian’s way of “jumping” on a Twitter hashtag was to insult someone as respected and as influential as Hilary Clinton by referring to her only child as a dog. What’s more laughable and unbelievable is that he actually thought he would get away with it. As you can see in the screenshot of the tweet above, five hours later, he was a jobless man all because of a reckless tweet. A moment of madness and less than 140 characters got him fired. It ‘s not the first time something of this nature would happen. Pamela Ramsey Taylor, the West Virginia official who referred to former first lady, Michelle Obama as “a Ape in Heels”(sic) on Facebook also lost her job because of her racist remark. And over here too, we have read and heard stories of people who reaped the dire consequences of their social media diarrhoea in ways they never thought they could – by losing jobs, favours or leverage. Yet, remain unguarded about their comments online. Like other fora where people discuss a wide range of subjects, there will be disagreements, heck, they’ll be people whose values and thought pattern are almost always at variance with ours, but that’s not enough reason to be uncouth when relating with them. The sad thing is that oftentimes, the people who are mostly rude are those who are nowhere yet in terms of achievements or pedigree. People who clearly have more reasons to be humble. These days it’s almost prideworthy to be discourteous. The more lowly a person is, the more arrogant they are. So, there’s a trending hashtag aimed at humiliating a particular person, and you hop on it, adding your own brand of insults to feel among, forgetting that you are job hunting, and that person could be of help to you. Someone posts their views about an issue, and just for likes and retweets and a couple of minutes of pseudo-fame you respond with the most sarcastic retort you can think of and get high on all the “Savage!,” “Ouch!” Gifs and Memes trailing your comments. A fleeting moment of negative appreciation. Social media will be the death of many young people; literally and figuratively. Every day they insult people who can change their fortune around within minutes, people whom they can learn from, people whose scribbled note or recommendation can open doors for them just because they are not discerning. I tell people all the time, you can say almost anything and get away with it, because you can deny you ever said it, as long as no one was recording, but you can never deny what you wrote, typed or have documented in any form. It’s all fun and games until someone loses a huge opportunity because of a reckless chat or tweet. While people are “feeling woke” and going with the flow on Instagram, Facebook and Twitter, never get carried away by it all. Social media does affect the real world out there. In case it didn’t sink in the first time – Don’t sabotage yourself, don’t allow your (mis)adventures on social media ruin you. I have come across some very rude people. You feel you are having a decent conversation with them, but all they are thinking is how to run you down. If this happens with a face to face conversation how much more virtual. The other day i got upset with a colleague of mine who insulted someone through a text message using my phone. Really, i wonder what goes through the mind of those who denigrate people. Thank you Lolade, well captured. In as much as Trump is a controversial figure, I’ve never taken him for much of his words. The media and the world have taken him for his every word and now there’s uncertainty and confusion. I don’t know where this will end for Trump but I want to believe everything he is doing is deliberate. He knows how to be civil and has shown flashes of it. The less we learn to believe what we see on social media, the better it will be for us. Hey Kunle! Been a while. Good to read from you. This piece is extremely instructive to we youths. These behavioural trends you observed are symptoms of interfacing with a relatively new technology in which we don’t yet fully understand and which didn’t come with a user manual. The more we see written piece like this that instructs us on the pros and cons of the use of the social media, the more we are likely to learn. I won’t even mind we tilting our school curriculum to start reflecting these obvious changes in my lifestyle. I guess that’s what education should be about. I should be thanking you. You raised some valid points here. I really hope we all learn from other people’s mistake on social media at the end of the day, we can’t afford to make those mistakes ourselves. Thanks Ayomide. well what can I say,they say the idle hand is the devil’s workshop, if the so called internet bullies called trolls are reasonably employed, they will not go around insulting and shaming people on social media, some people take delight in the suffering of another person. You just hit the nail on the head, trolls are certainly jobless individuals who gain sadistic pleasure in shaming people. Thanks for contributing.